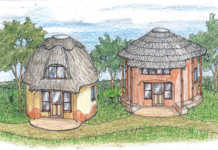 Jonno designs a single storey mechanically movable house for Lorna who is relocating to Zimbabwe. 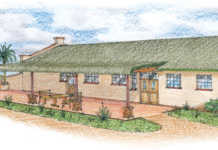 I am hoping that you are able to help me with a house plan. We – my husband and three daughters – have to relocate to a farm in Zimbabwe, which we do not own. We are looking to build a safe, economical, single-storey home. We always have family visiting to help out on the farm, so we would like to have a spare room, which should be slightly private from the rest of the house. In addition, the house should be built so that when the economy improves in Zimbabwe, we are able to extend it with an entertainment area or a second floor. Can you please help us with some ideas? Here is a request that might have universal appeal and where titled property is not the order of the day. In the UK and USA, some people have their complete house mechanically relocated to another site. 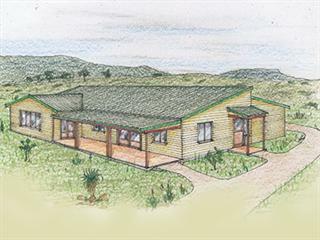 The home I’ve designed can also be moved: it is built in movable modules that can be loaded onto a normal flatbed truck. 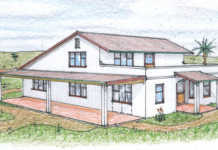 The sketch alongside depicts seven sections of the house that will be independently constructed and then bolted, one to the other (see the different-coloured sections). The roof is a segmented mono-pitched assembly. This is designed so that it is not too high, allowing the building to be transported on the flatbed safely through any bridge underpasses. These structures normally have a maximum height limitation of 4,6m. The floors will consist of a concrete slab, which can be left behind when moving – a small expense. The fourth bedroom can be added by relocating the bathroom and using it as a passageway to an additional bedroom or two, on that side of the house. The construction is that of ‘stud’ walling, clad externally with fibre-cement horizontal boards and internally with wood composition boarding, or something similar. The roof is of metal cladding, all very lightweight for purposes of cartage by truck. Author John Smith, better known as Jonno, can be contacted at Hillbilly Homes, PO Box 255, Estcourt 3310, tel 036 352 3178, fax 088 036 352 3178, cell 082 412 4459 or email [email protected]. Please provide details of the proposed development and any building material you have access to.